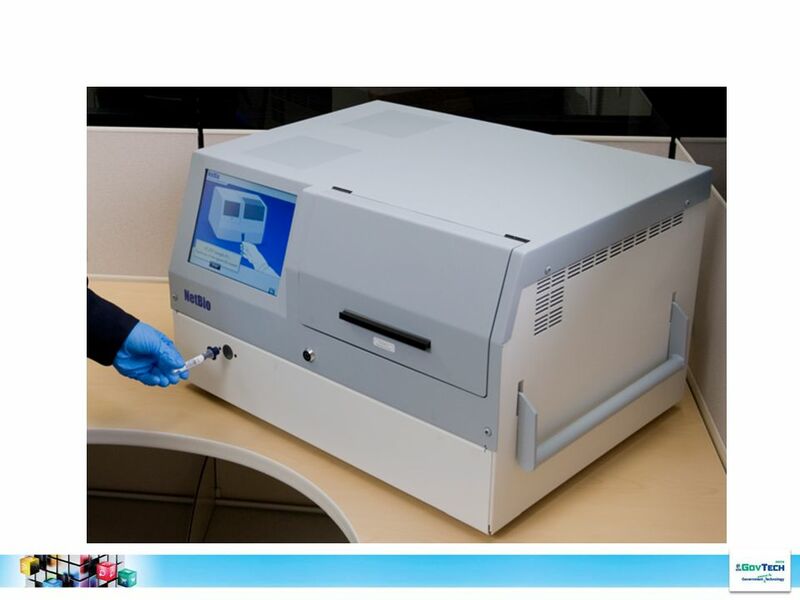 Sample Types: Fresh and dried buccal and blood swabs, purified DNA. 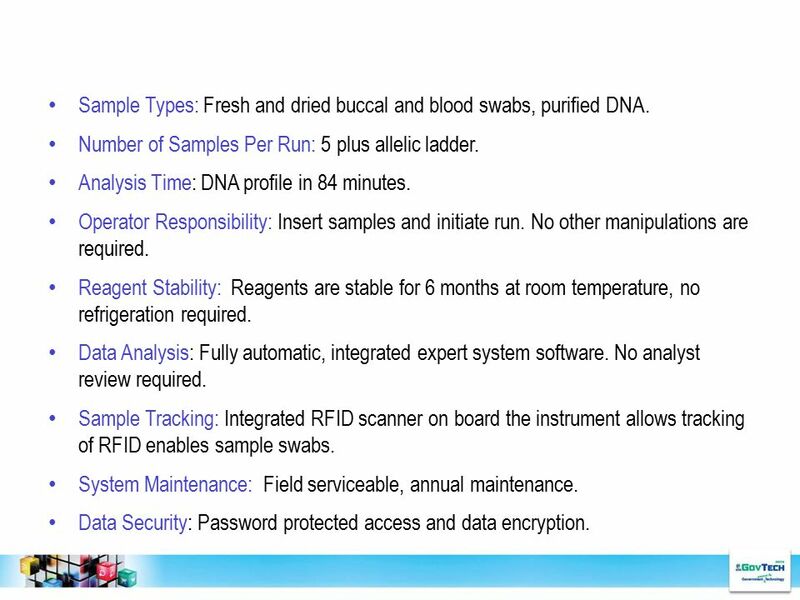 Number of Samples Per Run: 5 plus allelic ladder. 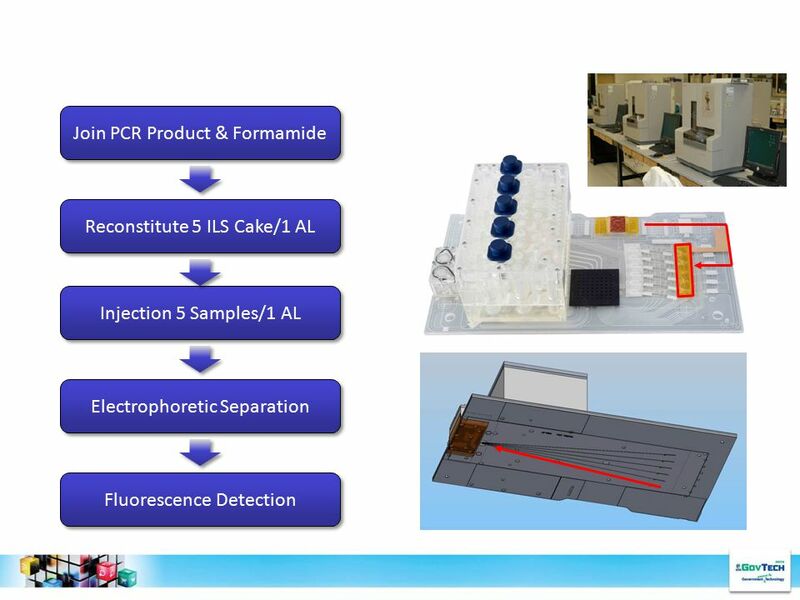 Analysis Time: DNA profile in 84 minutes. Operator Responsibility: Insert samples and initiate run. No other manipulations are required. 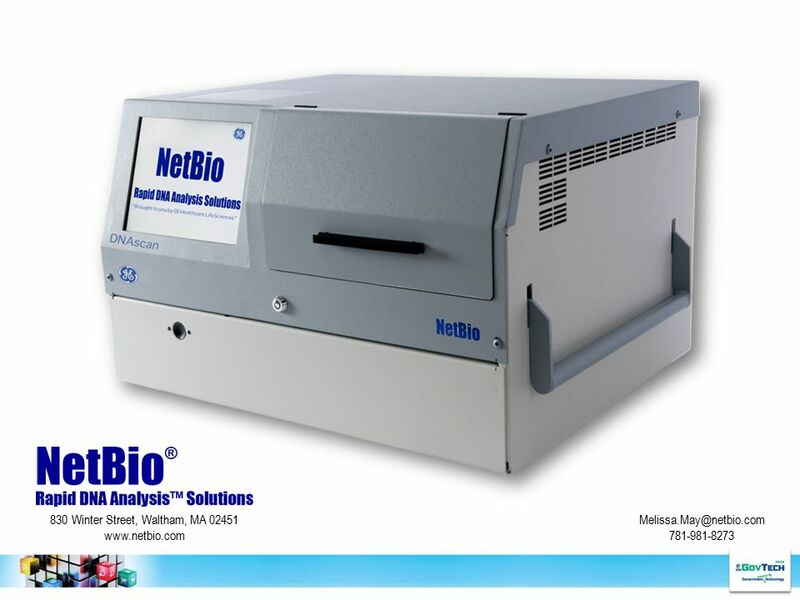 Reagent Stability: Reagents are stable for 6 months at room temperature, no refrigeration required. 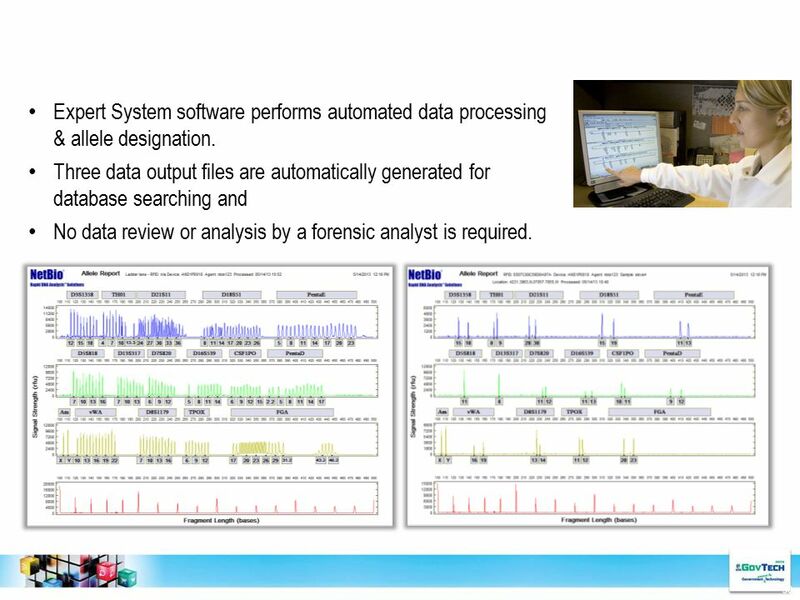 Data Analysis: Fully automatic, integrated expert system software. 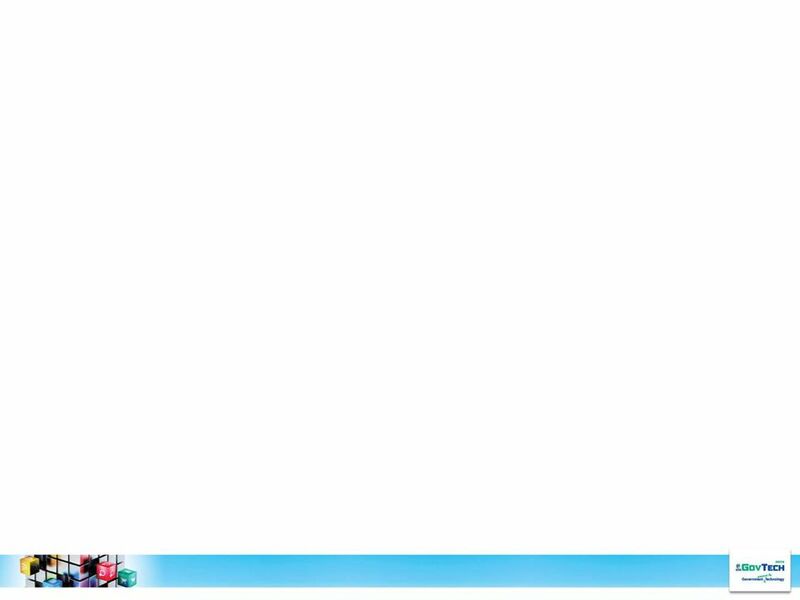 No analyst review required. 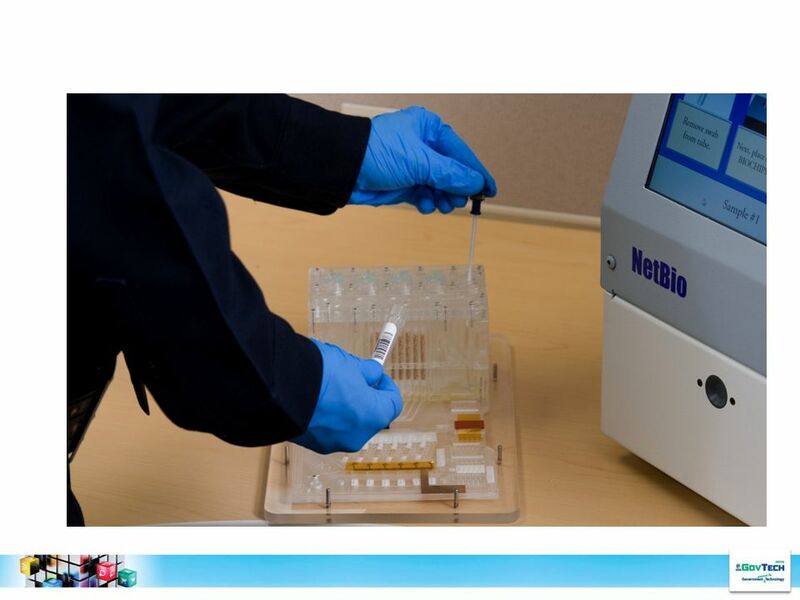 Sample Tracking: Integrated RFID scanner on board the instrument allows tracking of RFID enables sample swabs. 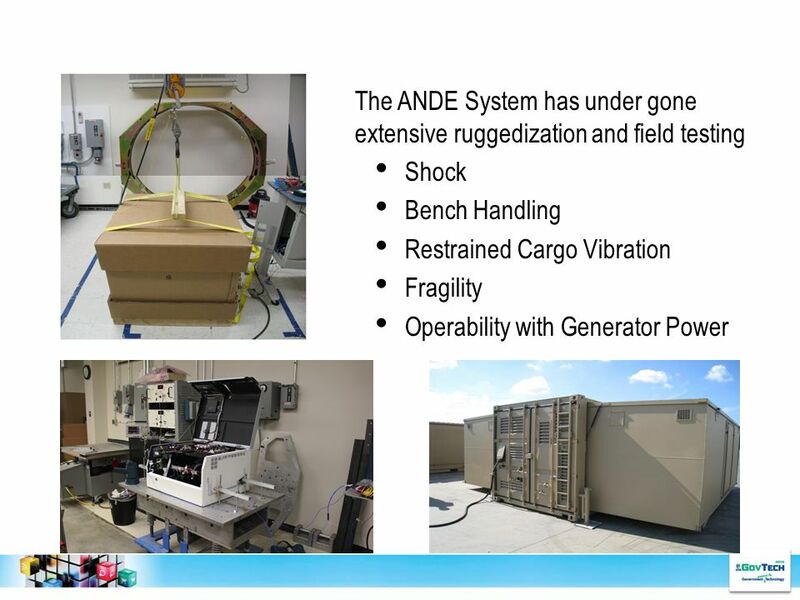 System Maintenance: Field serviceable, annual maintenance. 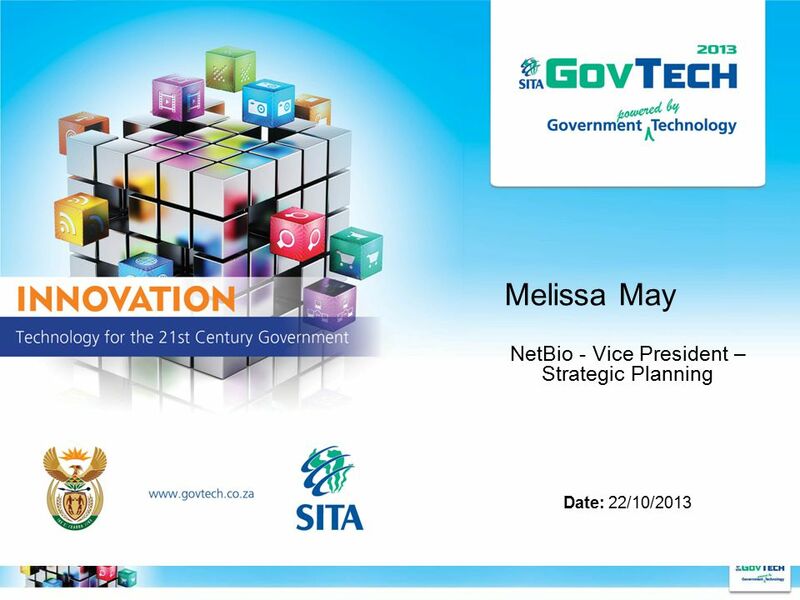 Data Security: Password protected access and data encryption. 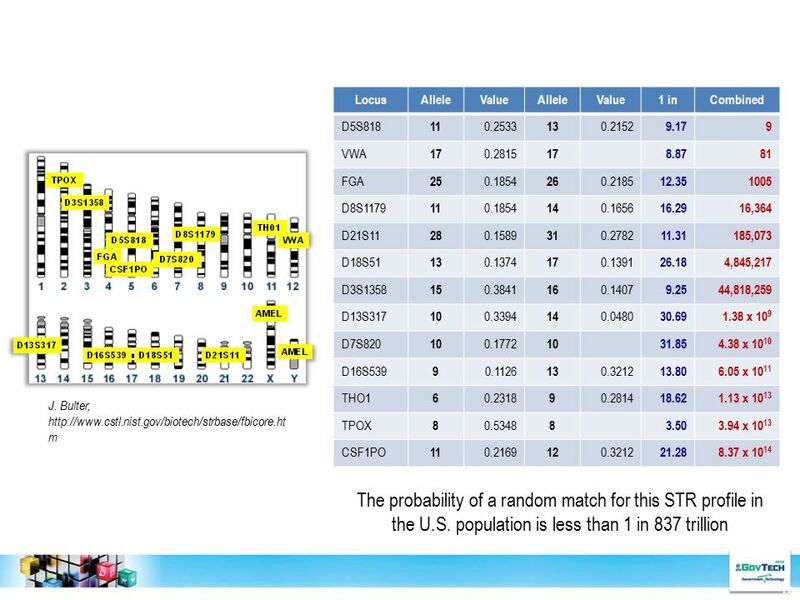 18 STR Analysis, How Does It Work? 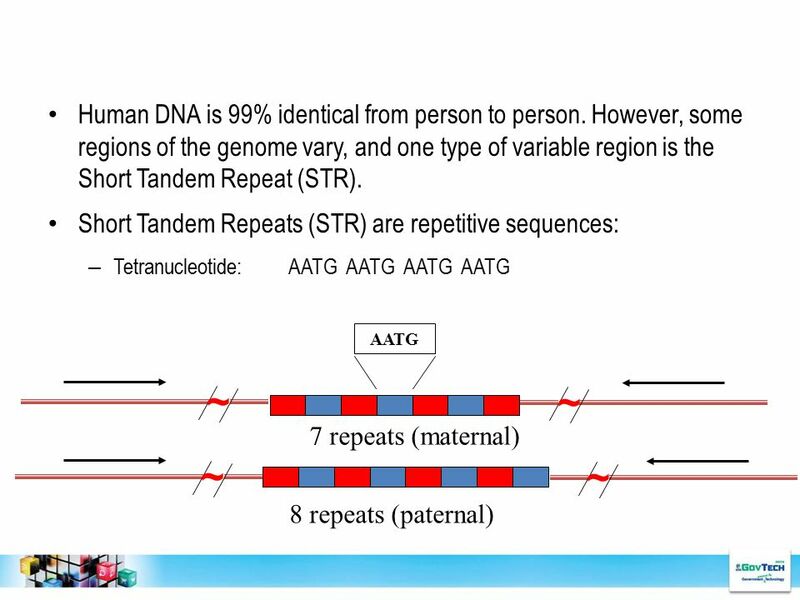 19 STR Amplification: What Are Short Tandem Repeats (STRs)? 20 STR Analysis, How Does It Work? 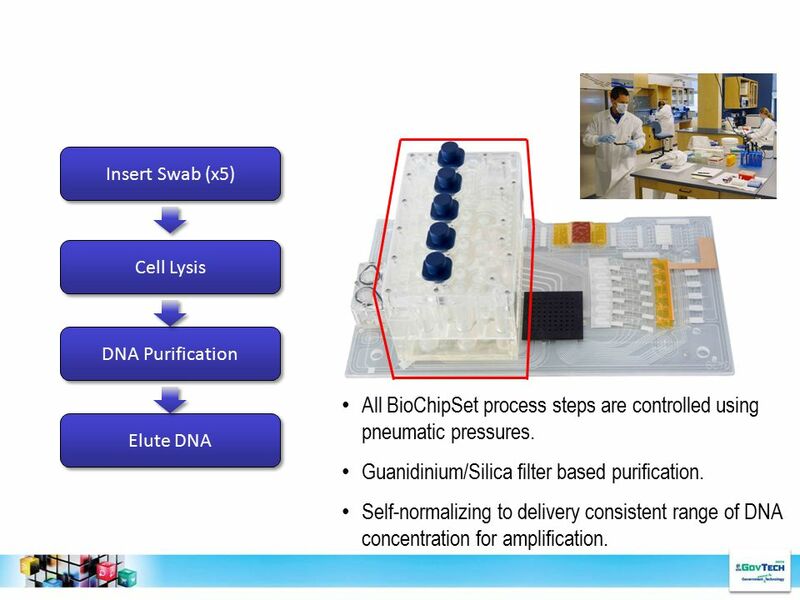 Insert Swab (x5) Cell Lysis DNA Purification Elute DNA All BioChipSet process steps are controlled using pneumatic pressures. Guanidinium/Silica filter based purification. 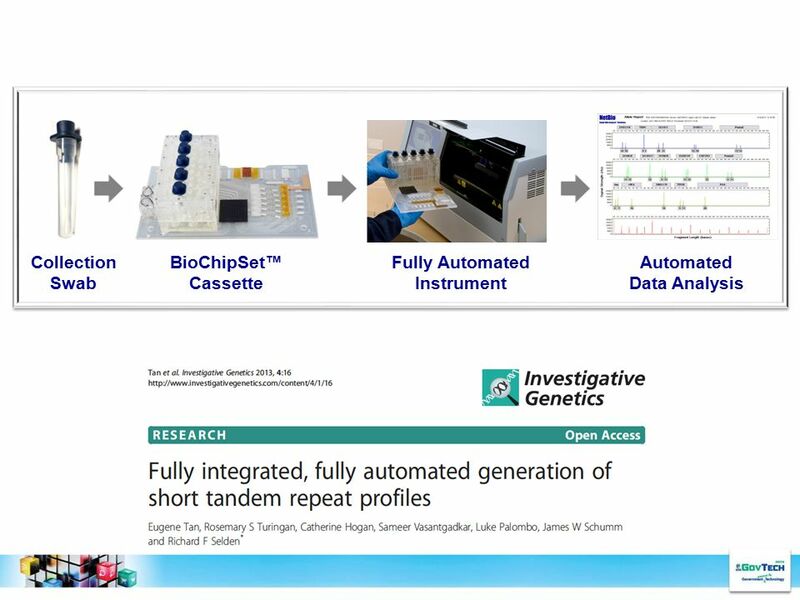 Self-normalizing to delivery consistent range of DNA concentration for amplification. 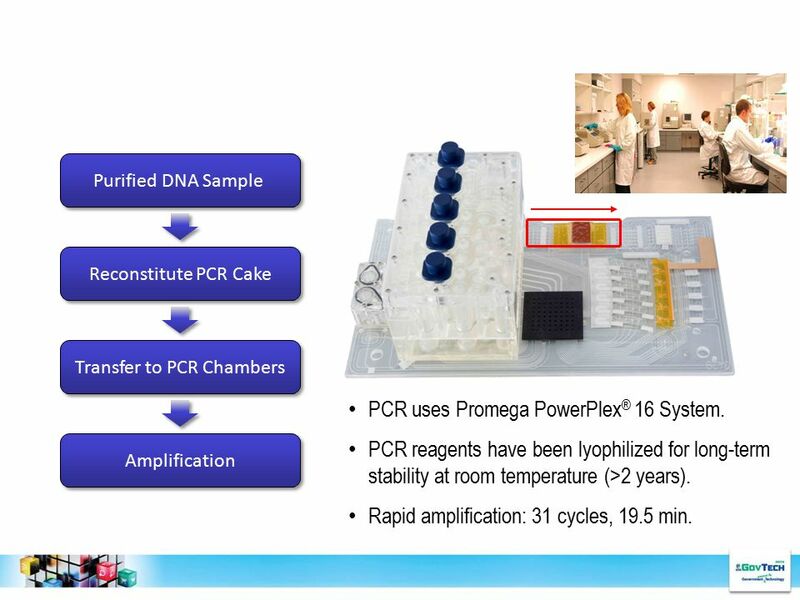 Purified DNA Sample Reconstitute PCR Cake Transfer to PCR Chambers Amplification PCR uses Promega PowerPlex® 16 System. 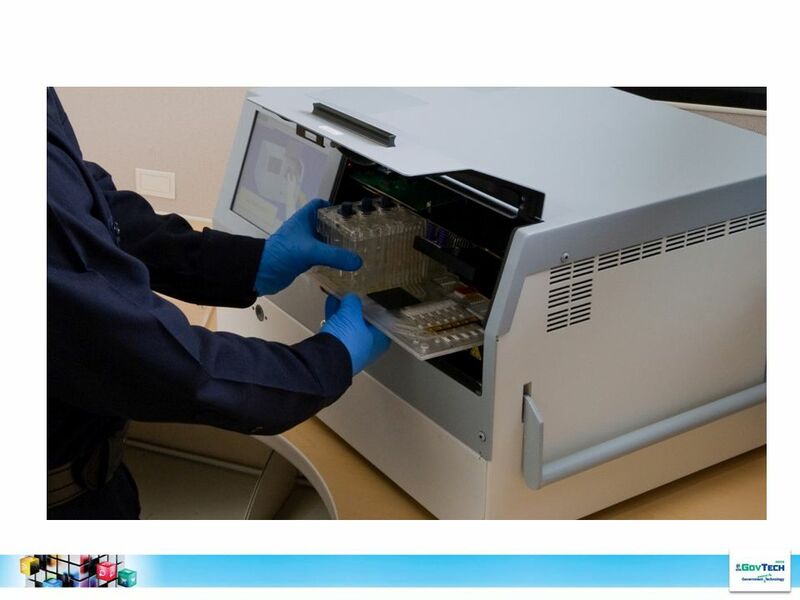 PCR reagents have been lyophilized for long-term stability at room temperature (>2 years). 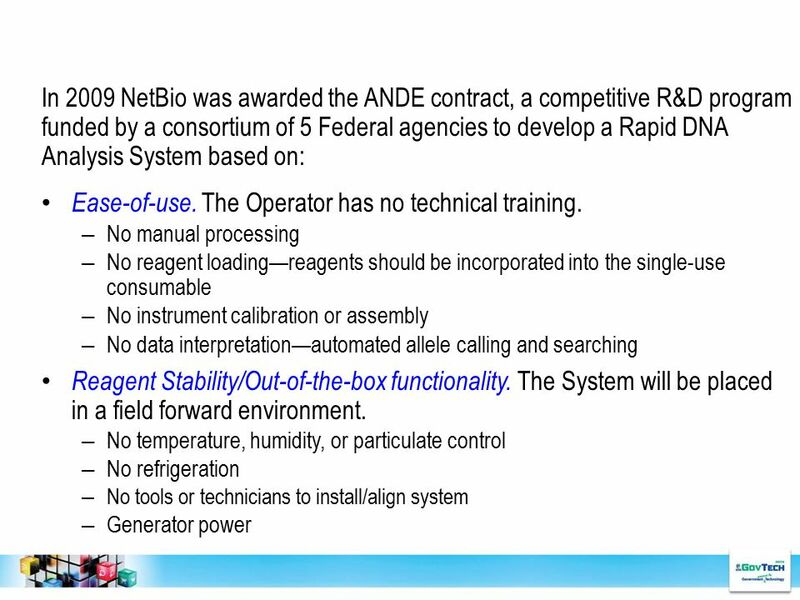 Rapid amplification: 31 cycles, 19.5 min. 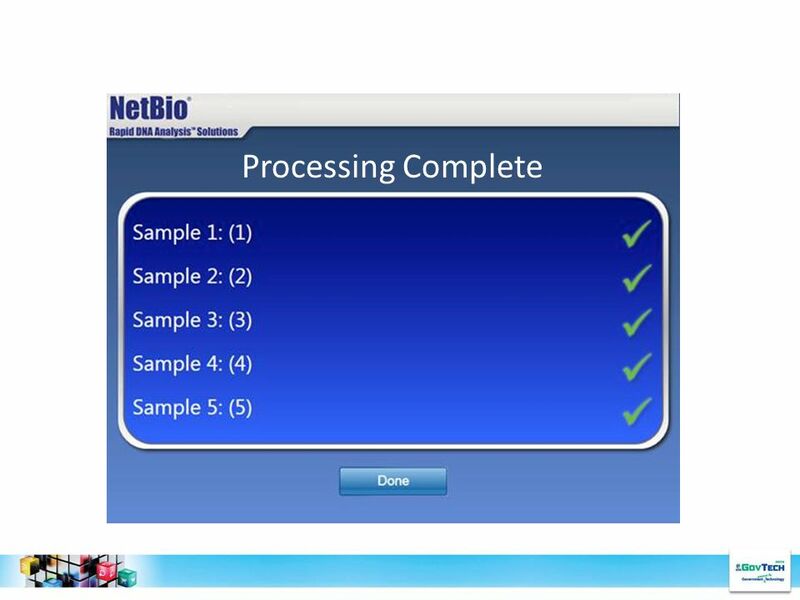 Expert System software performs automated data processing & allele designation. 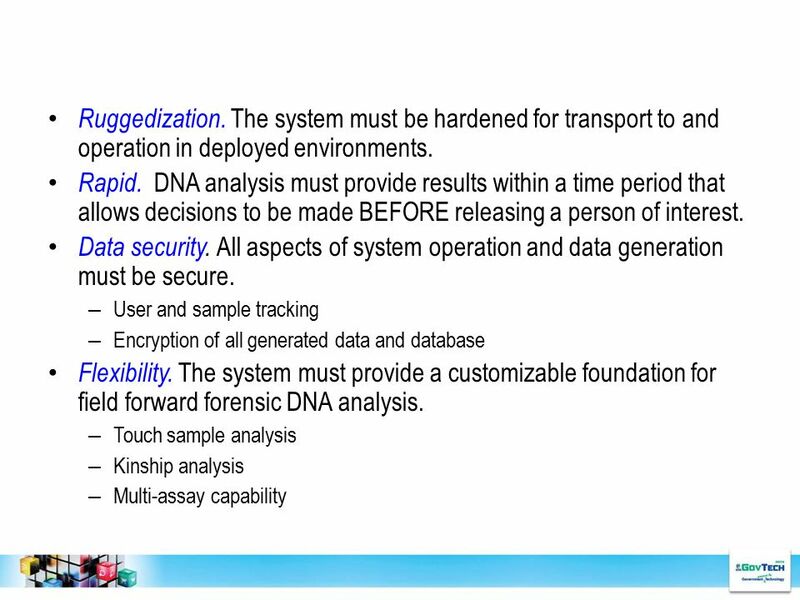 Three data output files are automatically generated for database searching and No data review or analysis by a forensic analyst is required. 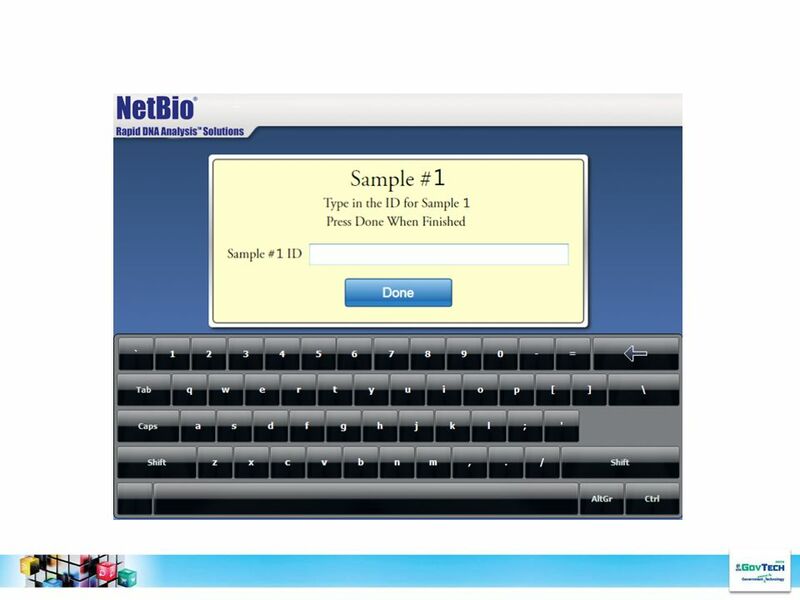 Download ppt "NetBio - Vice President – Strategic Planning"
#1 Task Determine if there is physical evidence that connects the suspect to the crime.Determine if there is physical evidence that connects the suspect. 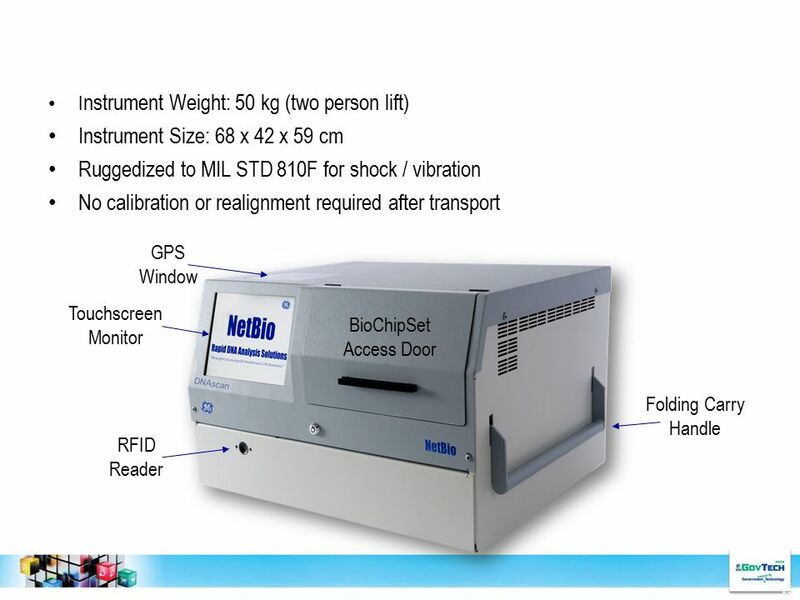 AS Bioscope TM Multiple sampling of your bacteria using an innovative portable respirometer. Bioscope is a portable real-time respirometer that provides. 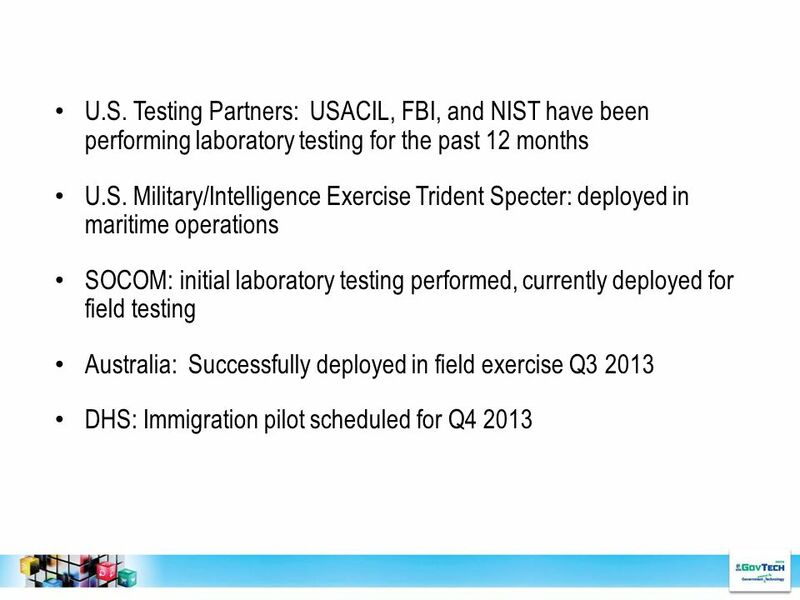 1 USG-754 Portable micro Laboratory for rapid explosives detection Global Security. 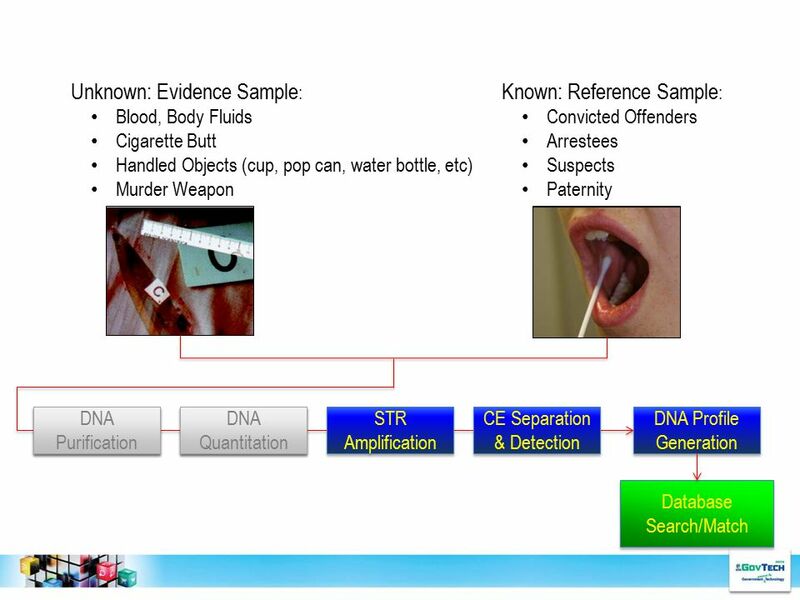 DNA Fingerprinting and Forensic Analysis Chapter 8. Fingerprints have been used since 1901 Fingerprints? 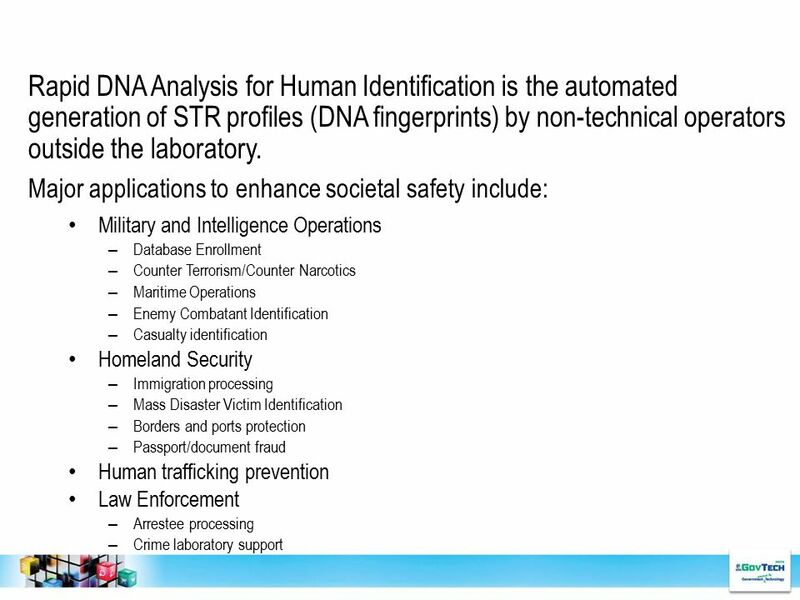 DNA Fingerprints ! 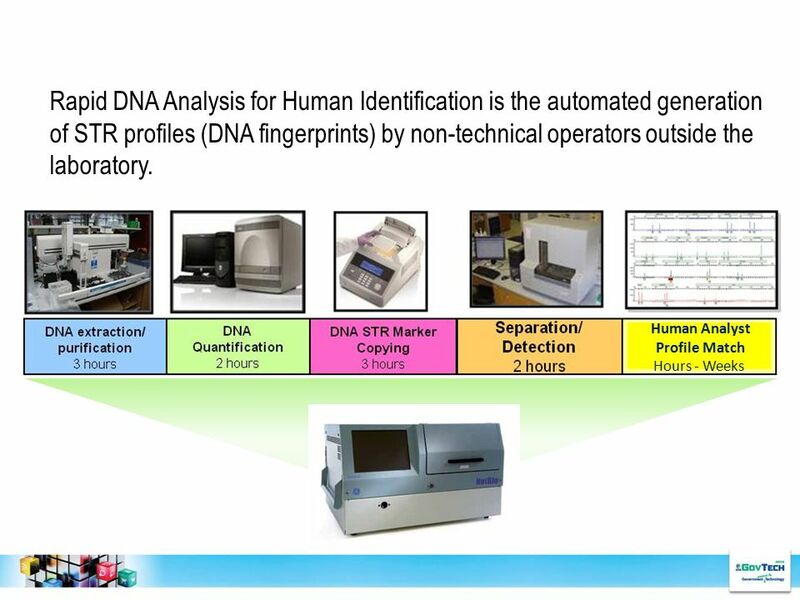 DNA Fingerprints since 1986. DNA fingerprinting Every human carries a unique set of genes (except twins!) The order of the base pairs in the sequence of every human varies In a single. Chapter 1. 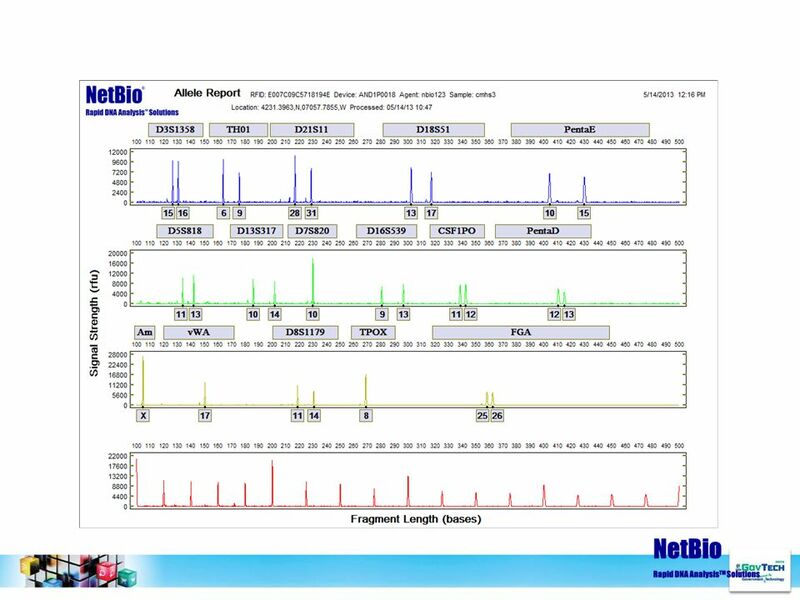 Speed of Analysis (Technology) Power of Discrimination (Genetics) Low High SlowFast Markers Used (Biology) RFLP Single Locus Probes RFLP Multi-Locus. 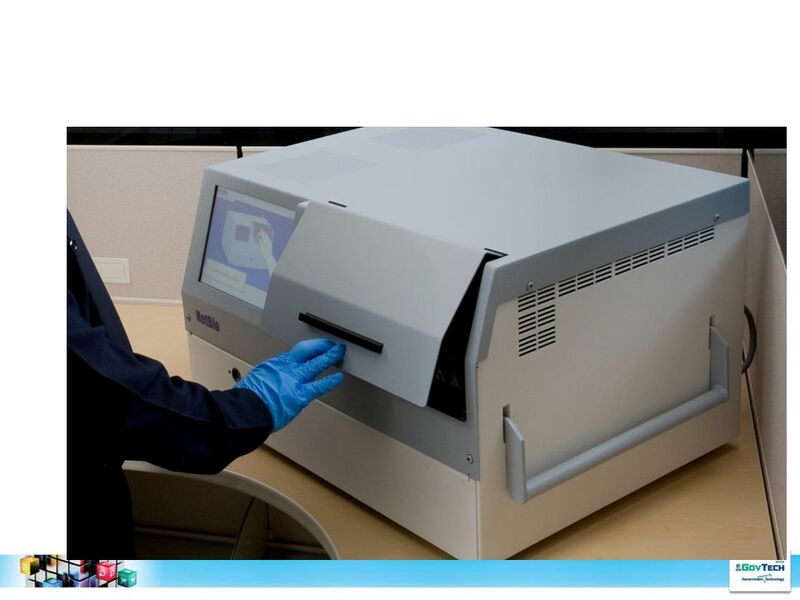 Forensic DNA Analysis Genome /04/2015. Forensics “Of, relating to, or denoting the application of scientific methods and techniques to the investigation. Forensics Chapter 8. 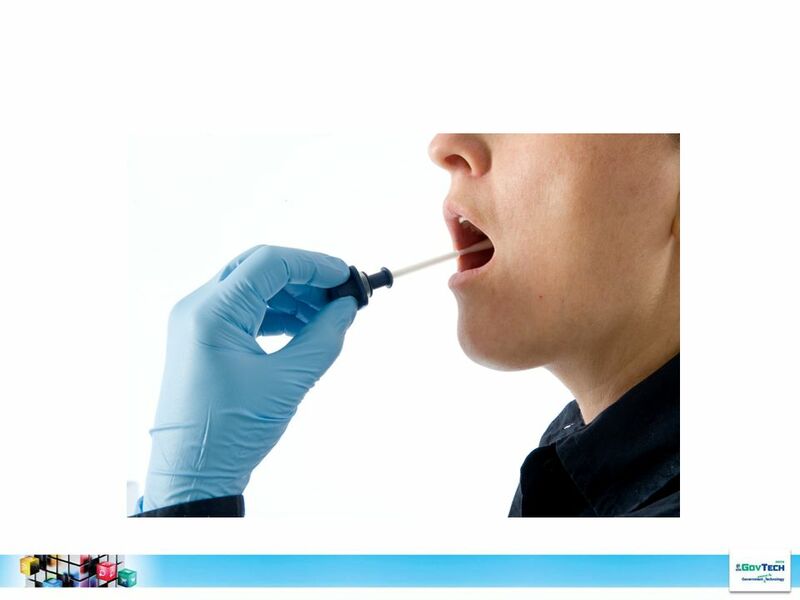 Central Points  DNA testing can determine identity  DNA profiles are constructed in specialized laboratories  DNA profiles used. 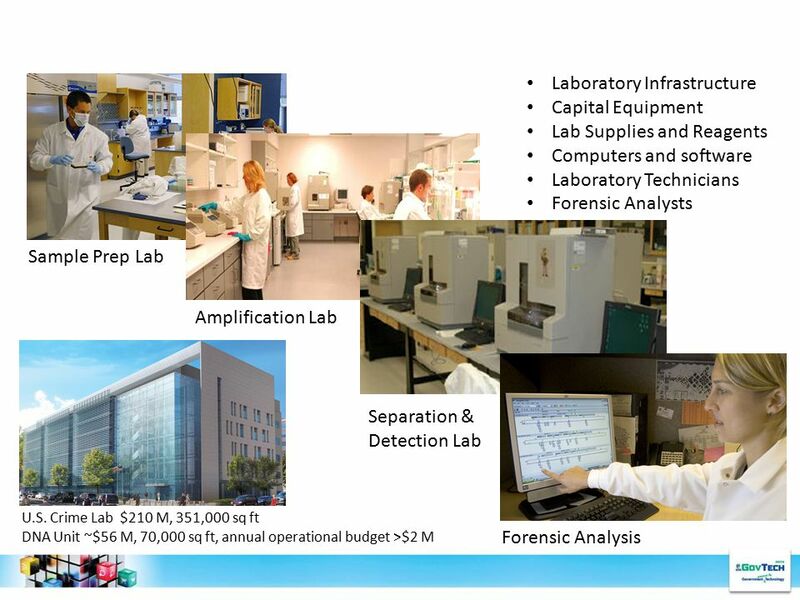 DNA Fingerprinting & Forensic Analysis. 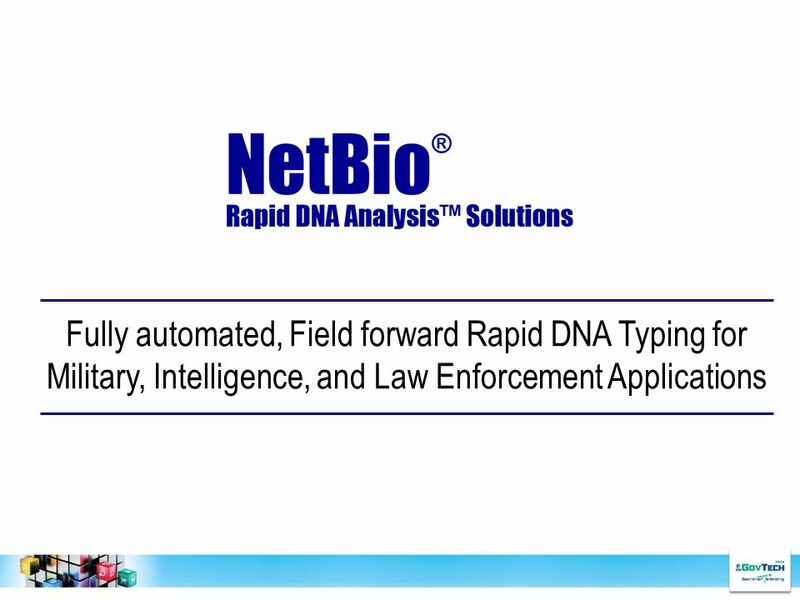 How is DNA Typing Performed? Only one-tenth of 1% of DNA differs in each person; this variation can create.